Imagine a spreadsheet grid where each cell can also call an API or repeat a job. This is what we are building. Our product lets users create interactive web apps using the spreadsheet skills they already have. 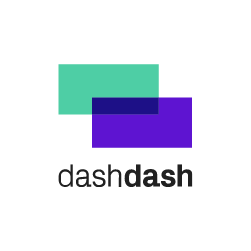 You can check us at dashdash.com. We have also been on the news. You can find us on TechCrunch (https://tcrn.ch/2LnB1r0), VentureBeat (https://bit.ly/2IGwgHS), Observador [pt] (https://bit.ly/2rZV0Ar) and many other media! an account dashboard where users manage apps and settings. the editor where users manipulate a list of programmable cells that can do computing, including services and automation. additional pages and features where we help users learn and extract the maximum value out of our core functionality and available integrations. Motivated to solve complex challenges. We are building a platform that provides General Purpose Computing to the masses; this requires cooking up new solutions that handle millions of calculations. Professional and fun. We value commitment and the ability to stay optimistic and focused, especially in the face of difficult challenges or feedback. But we also find plenty of time to talk about The Big Lebowski. Focused on quality and usability. We hate alarms going off and features that are half-baked as much as you do. Come build a polished product with us! At least 6 years of work experience as a software engineer. Fluent in design patterns and other Computer Science fundamentals. Proficient in HTML5 & CSS3. Proficient in SPAs (single-page apps). Proficient in front-end frameworks like React or Angular (we use React). Proficient in testing (unit tests, end-to-end tests). Able communicator in English. Speaking Portuguese is optional but welcome. GraphQL (with Apollo client). Strong plus. HTML5 Canvas for fin-hypergrid library. Strong plus. Webpack, PostCSS, cssnext & CSS modules. GitHub (Open source and internal repos). Expected Annual Gross Salary Range: 43.000-50.000€. Health Insurance for you and your family. Plenty of beer and frequent ice-cream. Complete Linkedin link or CV pdf. GitHub and/ or other public repos link. Which position you want to apply to and why. Also send three (3x) 1-hour slots of availability in the next 3-5 days. We create tools that make computation accessible to everyone. Coding used to be hard. You had to rely on complex processes of IT departments and agencies. dashdash changes that. We want you to create interactive web apps using the spreadsheet skills that you already have.